Looking to spice up traditional mashed potatoes? Combine butternut squash and mashed potatoes with brown sugar and ginger to give your family and friends a tasty side dish. I’m back from my babymoon–energized and relaxed and ready to share a few tasty fall-like recipes. Last month, I shared my apple butter pork chops. 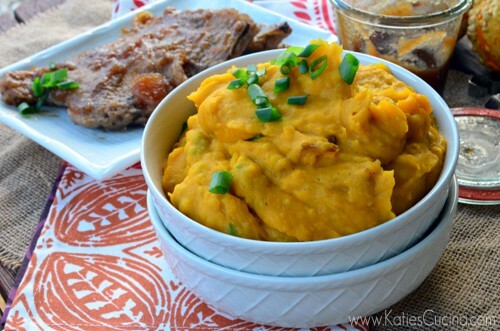 Pictured in some of those photos was this recipe for Ginger Butternut Squash Mashed Potatoes. I wasn’t sure if my husband would go for these doctored up mashed potatoes. He is not a big fan of ginger, so I decided to reduce the amount of ginger that was initially called in the recipe. I also added more brown sugar, because just like butter–everything is better with a little more brown sugar! I did not give Jon a full serving of the Ginger Butternut Squash Mashed Potatoes only in fear that he would take one bite and then eat around the sweet and savory untraditional potato! I was pleasantly surprised–he ate them quicker than I was able to cut up my pork chop! And then asked for more. He loved them! Shocker to me since I knew the ingredients in the potatoes. In fact, he has asked for me to make these a few times now. 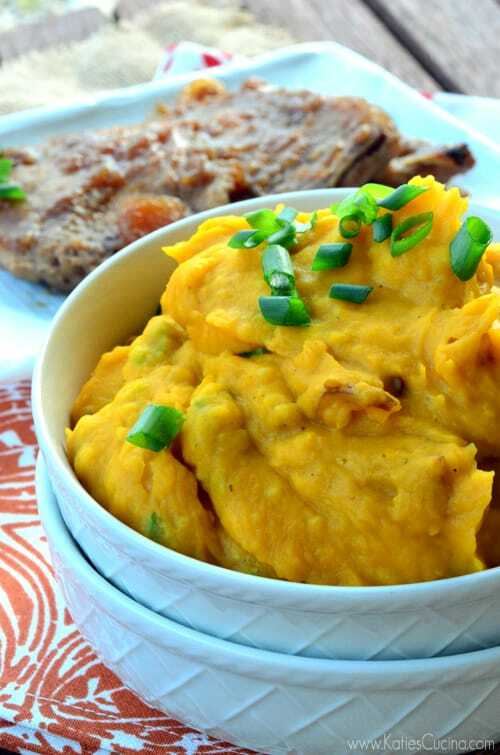 So whether you want to spice up this holiday and go the non-traditional mashed potato route, or you want to spice up your leftover mashed potatoes (which is what I plan to do on the Friday after Thanksgiving), these Ginger Butternut Squash Mashed Potatoes are sure to be a hit in your house just as much as they were in mine! Microwave squash following package instructions. Transfer squash to medium bowl. Reheat leftover microwave mashed potatoes. 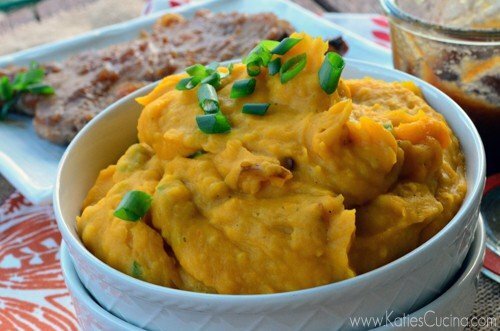 Stir the mashed potatoes into the butternut squash along with the brown sugar, butter, ginger paste, salt, and pepper. Slice the onions. Fold mashed potatoes and all but 1 tablespoon of green onions into squash mixture. Serve and garnish with additional green onions. Just discovered your blog yesterday! 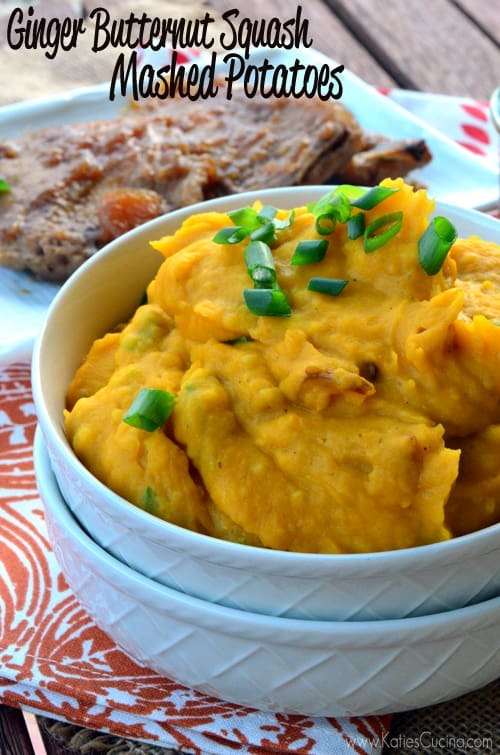 This is a fantastic way to jazz up mashed potatoes… I often make roasted butternut squash as another side dish for Thanksgiving, but this is a great way to combine both the mashed potatoes and the squash into something new and delicious! Thanks Patsy! Yes–great way to combine both and add more flavor to the meal! Thank’s Jocelyn! I can’t wait to make this the day after with my leftover mashed potatoes!